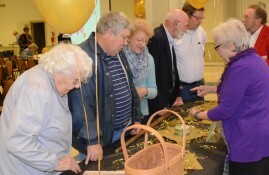 WARSAW — Visits by Metcalfe Beck, an early county settler; John Pound, former owner of The Pound Store; and former sheriff James Cisney were made during the 50th annual banquet of the Kosciusko County Historical Society, Thursday evening, Oct. 22. The annual banquet kicked off the celebration of the 50th year for the society. The program included video presentations recapping what was happening nationally and locally in 1965 through photos and clips from Ralph Boice’s film collection, an overview of the society’s history and past activities, along with memories from charter board member Carl Diehl; photograph slide show of the hundreds of volunteers over the past half-century. The program, titled “As The Ivy Twines” was written by Sally Hogan, with board member Michael Alspaugh portraying John Pound, Metcalfe Beck and James Cisney. The songs were lead by Bill Landrigan and guitarist Dan Kuhn. Dan Coplen was the master of ceremonies for the program. 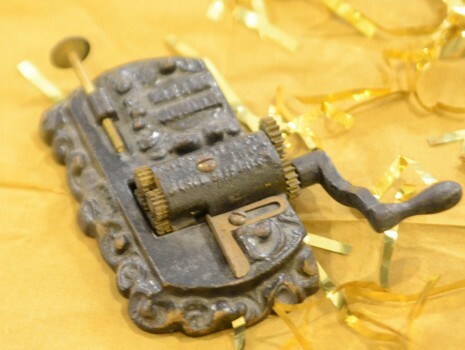 The county historical museum asks if any one knows what this item is to please contact them. Newspaper clippings, photographs and six items were displayed for guests to view. June Thomas explained the mystery items toward the end of the meeting. The items were a crutch, a piano roll, knitting needles for socks, darning egg, a hair receiver and a metal item that no one knows what it may be. Thomas asked any one who may know to contact the museum. A brief business meeting was conducted, electing six members to the board: Bill Huffer, Connie Schlag, Avis Gunter, Janice Long, June Thomas and Michael Alspaugh. Sharon Sucec, librarian, presented a brief report regarding the genealogy room, which she stated was overrun with visitors during the county fair. Over 42 visitors were recorded during a three-week time period coming from such states as California, Maine, Texas, Minnesota and places in between. She additionally reported over 200 county photos were scanned from May to September when, during First Friday events, the society offered to scan photos. This now brings the collection of photographs to over 9,000. Sucec stated the society has submitted information to the Legacy Program in connection to the state’s bicentennial celebration. A book will be written about schools in the county, organized by townships with names and places between 1835 and the consolidation of schools in 1975. Individuals who have stories firsthand or passed down through generations and photographs are asked to share the information with the society. Sucec stated they will use as much information received as space allows. The book is expected to be available in June. It was announced the 2016 historical society calendars are available through a combined effort of the genealogy department and calendar committee. The calendar features each community through photographs with over 100 facts included throughout the calendar. Only 250 calendars are available. Before the close of the meeting, Jerry Frush, board president, announced upcoming activities, which include a Passport to Kosciusko County book, home tour, Haunted Jail and Walk-A-Bout Hastings. This group takes a look at some of the historical items displayed for the annual dinner. 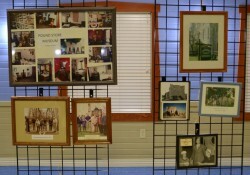 A pictorial display of Kosciusko County Historical Society events.